Welcome back. Time’s up. I haven’t blogged about sugar-sweetened beverages in over four years. Do you remember when then-New York City Mayor Bloomberg went after sugary beverages? His proposed law limiting the size of many sugar-sweetened drinks to 16 ounces never took effect and was eventually overturned. 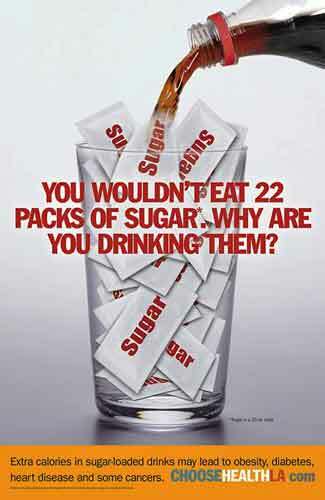 I blogged about that action and similar campaigns around the U.S. in Sugary Beverage Addendum. That was an addendum to the post Research Sponsor Bias, a review that found studies funded by beverage and sugar industries were five times more likely to conclude there was no link between sugar-sweetened beverages and weight gain than did studies with no industry affiliation. I’m picking up the topic again because Berkeley, California, had overwhelming voter support to impose a one-cent per ounce tax on specified sugar-sweetened beverages, effective 1 January 2015. Although the tax is levied on distributors, retailers pass through part of the tax to consumers. One survey found that shortly after the tax was imposed, 69% of the tax was added to the price of sodas and 47% of the tax was added to the price of other sweetened beverages. Did the tax have any effect on consumption of sugar-sweetened beverages? That’s what a team of researchers from the University of California at Berkeley, Davis and San Francisco, as well as Stanford, set out to gauge three years after the tax was imposed. To measure response to the tax, the researchers collected annual beverage frequency questionnaires via street intercept surveys from 2014, before the tax was imposed, to 2017. They polled about 2,500 people each year in high foot-traffic intersections in demographically diverse neighborhoods across Berkeley and, for comparison, in Oakland and San Francisco. They found that, in 2014, sugar-sweetened beverages were consumed 1.25 times/day in the Berkeley neighborhoods and 1.27 times/day in the comparison city neighborhoods. Berkeley residents’ consumption dropped sharply in 2015, and by 2017, the residents reported drinking 52% fewer servings of sugar-sweetened beverages than they did in 2104. Water consumption increased 29%. The changes in Berkeley residents’ consumption appear directly related to the tax as residents in the Oakland and San Francisco neighborhoods reported drinking about the same number of sugary beverages in 2017 as they did in 2014. 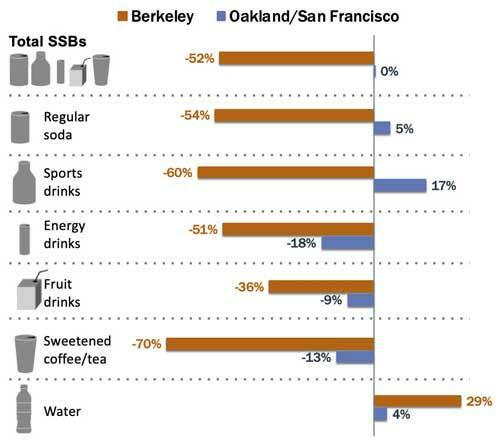 Change in beverage consumption in Berkeley and comparison cities 3 years after Berkeley taxed sugar-sweetened beverages (SSB) (from ajph.aphapublications.org/doi/10.2105/AJPH.2019.304971). Addressing study limitations, the researchers noted that their method of data collection--street intercept survey--does not provide a random sample of city residents and that other communities should be surveyed. 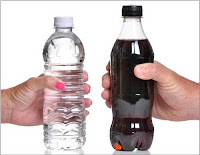 Nevertheless, the results strongly suggest that taxing sugar-sweetened beverages can be an effective approach to encourage healthier drinking habits. That said, I (and I’m sure the researchers) would like to see longer term results. Will consumers continue drinking healthier beverages and will that change have an effect on obesity, diabetes, cardiovascular disease and tooth decay? Oh, if you were wondering, most of Berkeley’s sugary beverage tax revenue supports nutrition education and gardening programs in schools and local organizations working to encourage healthier behaviors in the community.